Can we ever escape the wrongs we’ve done, or the wrongs done to us? In the long hot summer of 1972, three events shattered the serenity of ten-year-old Marsha’s life: her father ran away with her mother’s sister Ada; Boyd Ellison, a young boy, was molested and murdered; and Watergate made the headlines. Living in a world no longer safe or familiar, Marsha turns increasingly to ‘the book of evidence’ in which she records the doings of the neighbours, especially of shy Mr Green next door. But as Marsha’s confusion and the murder hunt both accelerate, her ‘facts’ spread the damage cruelly and catastrophically throughout the neighbourhood. Winner 1999 Orange Prize for Fiction. 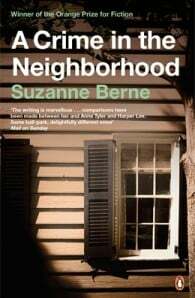 Suzanne Berne was born in Washington, D.C., and now lives with her family outside Boston. She is a frequent contributor to The New York Times, and her fiction and essays have also appeared in a number of magazines. Her first novel, A Crime in the Neighbourhood won the 1999 Orange Prize for Fiction. Her latest novel is The Ghost at the Table.